Summer’s just around the corner and you want to be able to rock those tank tops and sleeveless shirts with pride, right? 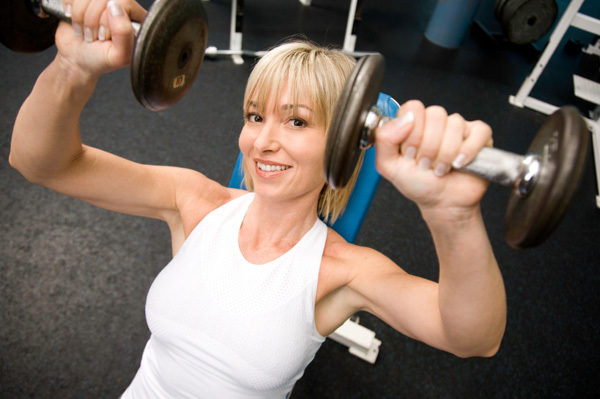 Here are three ways to flight arm flab and sculpt those guns. The first step to toning every body part is burning off fat through old-fashioned healthy eating and plenty of cardiovascular exercise, which will torch calories and make you more toned overall. Running or powerwalking are great ways to burn calories while enjoying the spring air; or, you can try a spin or step class to really amp up your fat burning. The best exercise for your upper body is one that you can do at home — for free! Push-ups will not only tone your arms, they’ll help sculpt your shoulders and chest as well. So the next time someone tells you to drop and give them 50, do it! If you’re one of those people who hasn’t done a push-up since 10th-grade gym class, try doing them from your knees. If you’re a knee push-up veteran, do as many as you can from your toes. If that becomes too easy (ha! as if), try stacking your feet. Always aim to get your elbows into a 90-degree angle — anything less is cheating. Want to eliminate that unsightly underarm jiggle? Focus on toning your triceps. Tricep dips are an ideal exercise for this, and you can easily do them at home. Just find a sturdy chair or some stairs, position your arms behind you with your palms on the step or chair seat and your fingers facing forward, and lower your body to the ground until your elbows are at a 90-degree angle. Another great tricep move is the overhead extension. Start with something manageable, like a five-pound weight. Hold it above your head and lower it behind your head, keeping your elbows as close together as possible. Make sure to increase your weight over time to see results. Don’t focus all your attention on the backs of your arms — the fronts need work too. A simple bicep curl should work. Hold a dumbbell in each hand at your hips with your palms facing upward, and slowly bring the weights to your shoulders. Repeat often. If you want to see results, try to use as much weight as you can possibly handle — try the 20-pounders if you dare — for as long as you can stand it. You’ve really got to push yourself to see a difference; this goes for all exercise moves.